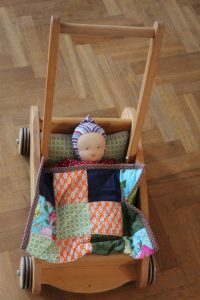 But we still had a wooden toddle wagon around which both our older children used when making their first steps. 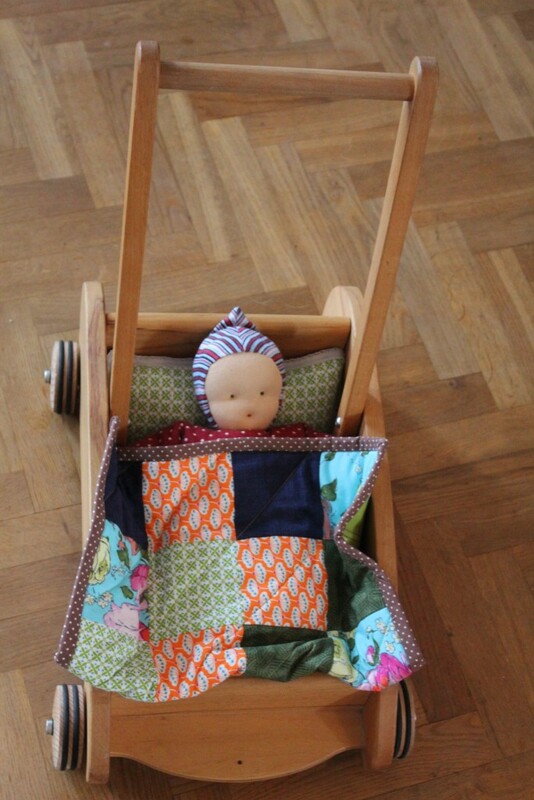 So how about turning that into a little stroller for dolls? All it needed was some bedding and that’s where the fabric scraps came in handy that I tend to hoard from previous projects. I simply cut squares 10 x 10 cm, arranged them in a 4 x 5 rectangle and made a little quilt top. 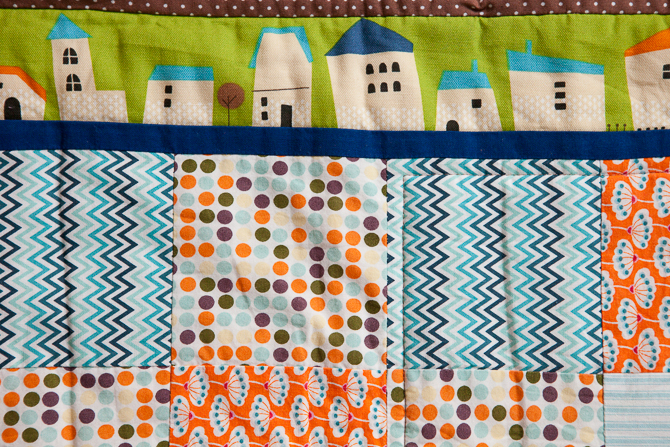 For the backing I used the village fabric from my last baby blanket and after quilting some quite crooked diagonals used up my polka dot binding strips left over from that same blanket. Finally, I made a little two sided pillow to go with it – simply stuffed with some polyester filling – a jam funnel comes in quite handy! 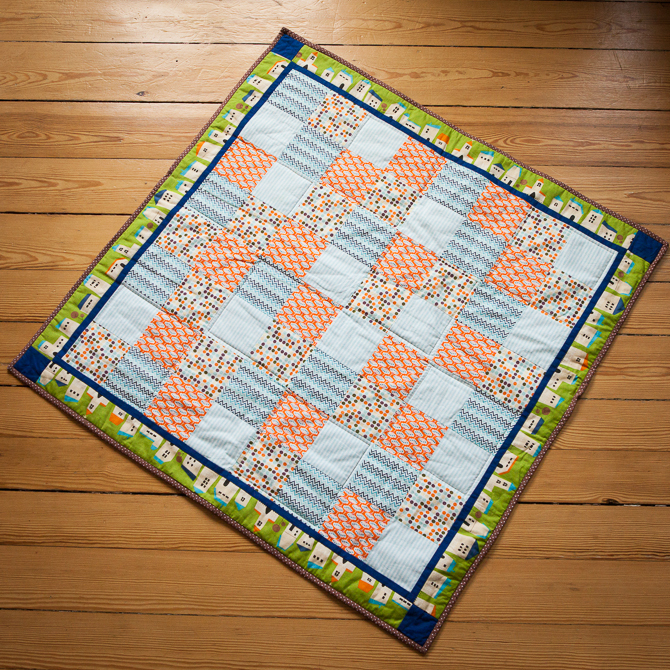 Such a fun, fulfilling and quick little project – it took all but one afternon! Happy birthday to the smallest member of the family! … to raise a child, they say. 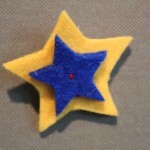 Which is why I was utterly happy to find the above fabric to use as the „star“ of my latest baby blanket. It’s been quite a while since I last made one – this one’s for my little great-nephew who was born just a month after my own little one. 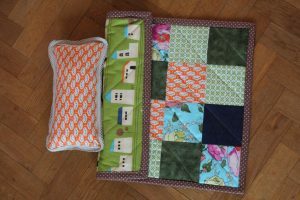 Even though these blankets all follow roughly the same design, it’s always great fun to pick out fabrics for a new one. This time especially so, as I got to visit Kathi Kunterbunt for the 4 fabrics featured in the squares. 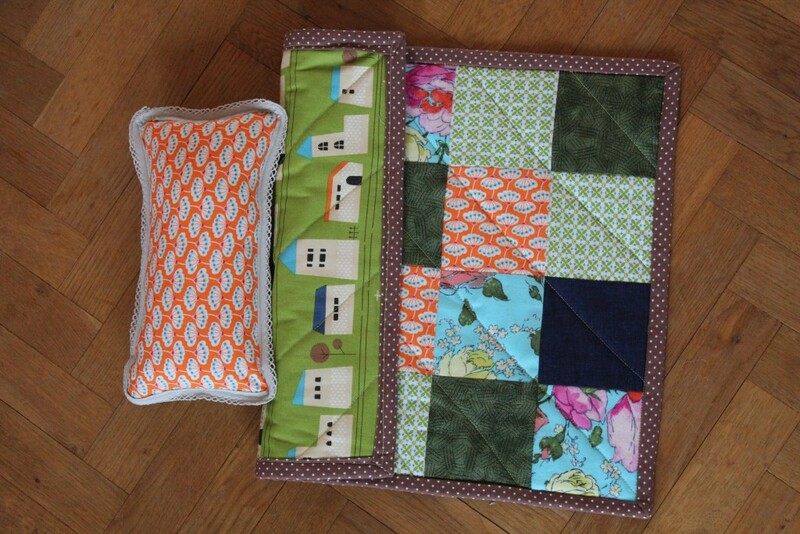 Then it was off to cutting, more cutting, piecing and sewing (most rewarding). 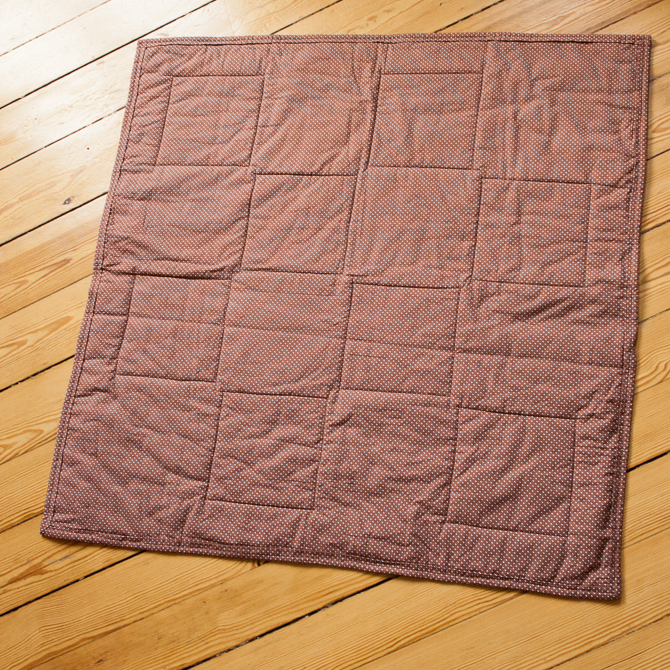 After finishing the top, finding some backing fabric proved unusually tough. I had pictured some grey vichy (checkered) fabric but couldn’t find anything like it. However – polca dots to the rescue! I guess noting can ever go wrong with polcadots. 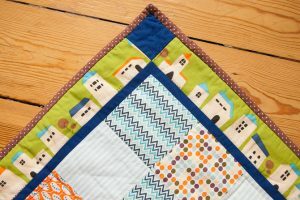 Only after buying the brown fabric I realised that my village fabric also features some polcadot details, which prompted me to also use the backing for the binding. 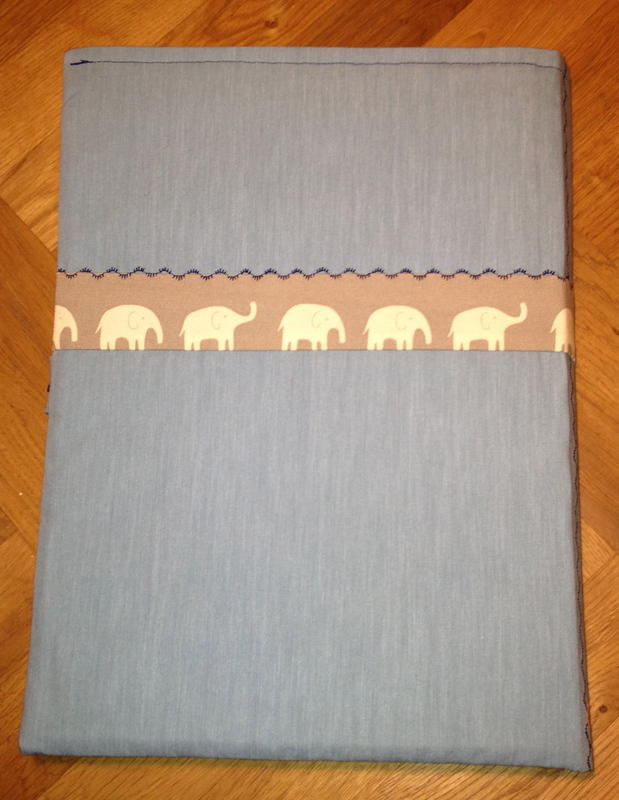 This is the first time I sewed the binding with just one loooong strip of fabric – making for such clean corners. I followed this tutorial (in German) and it made everything so much easier! 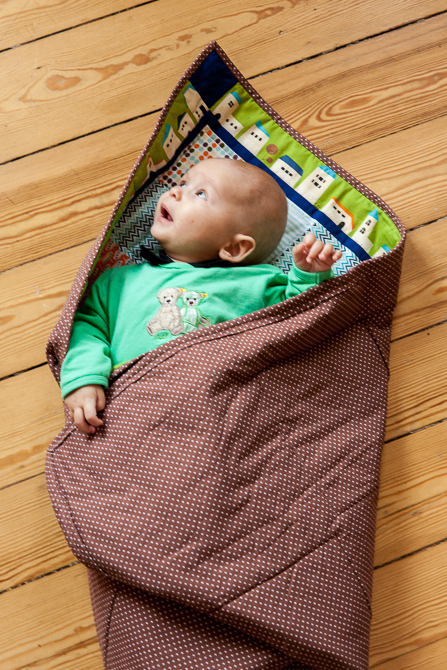 So here it is, Zwirnstern’s latest baby blanket, modeled by its new owner. Thanks to mea photography for both model and lovely pictures! Just quickly checking in to share one of this year’s mardi gras costumes. I figure it’s better late then never, I love this particular costume and I don’t want the blog to be silent for another year. As you may or may not have guessed from the title, my 4-year-old decided she wanted to be a princess for mardi gras this year. Having seen and admired Ashley’s lovely Rapunzel costume before, I knew I wanted to do something like it and set out to find some fabric. I fully intended to use some of the fabric specifically designed for costumes – some shiny or glittery, as well as usually quite cheap polyester… Then I thought why not make it from velvet? 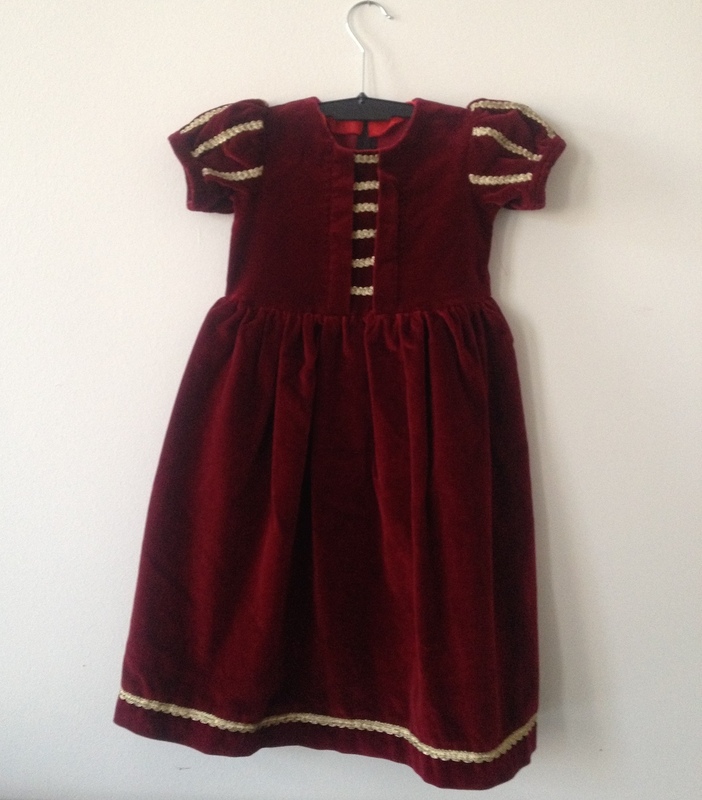 Enter a beautiful crimson cotton velvet – which I ended up liking way more than the costume selection! For the top I adapted a bodice pattern from an ottobre design pattern following Ashley’s directions. I only decided to ad the lace strips after sewing the front folds and attaching the bodice to the skirt – it would of course have been much easier to do that before! The pattern also included little puff sleeves that I could use. The back features a simple zipper and the skirt is basically a big rectangle gathered at the top. 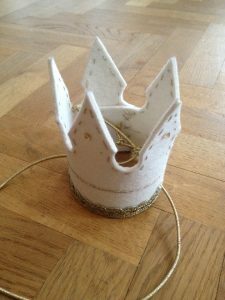 To complete my little princess I made a little crown from felt I had left over from the advent calender and added some gold embroidery and a couple of self-adhesive sequins. 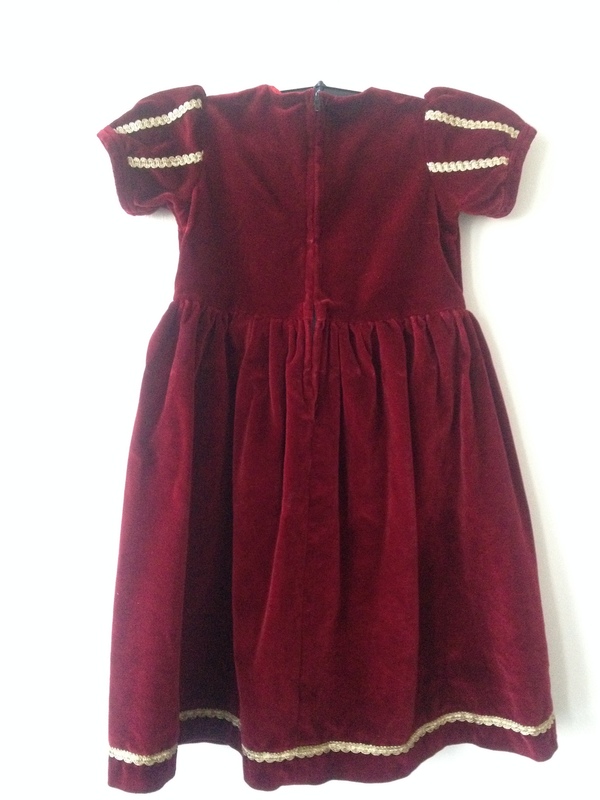 Both dress and crown have gotten quite some wear for dress-up at home which I love! Nothing better than expanding that dress-up pile. This is partly because there haven’t been many projects completed during that time and those that have I didn’t take the time to photograph and blog about. This, in turn, is because I never know whether this blog serves any purpose at all – it doesn’t have many readers and it also doesn’t offer much valuable information. It probably won’t come as a surprise that I’ve considered shutting it down entirely quite a few times and am still on the fence about that. Since I do, however, use it as some kind of a sewing journal and to quickly look back on what projects looked like or when I completed them, I’ve decided to keep it for precisely that purpose. As our family has grown once more, I will be staying home a while and this just might lead to some more sewing around these parts, so who knows, maybe there will be more than one post in 2014? Should there be anyone out there reading this blog – I’ll always be happy to answer any questions! I’d love to hear from you. This somehow turned into a second blog-opening post. Things have changed quite a bit since 2008. 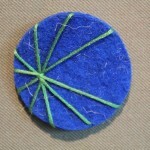 Zwirnstern is a sewing blog most of the time and as with crafting entirely, change is evident. 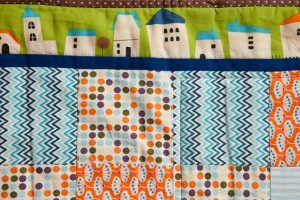 Sewing has become much more popular in recent years – my town now has a number of veritable fabric stores with quite nice selections (kathi kunterbunt being my newest discovery). So by now, I’m buying fabric offline and turning to my favorite online stores but for extra special fabrics. I’m working on a combination of both of them hopeful turning out as well as planned (check the facebook page for a sneak preview!). Here’s hoping I’ll blog the result soon! This time around, I went for scarf collars using up some of the leftover fabric I own and lining it with warm and comfortable fleece. Throw in some velcro, and you have quite a nice neckwarmer! I made 7 of them – unfortunately though, I didn’t photograph them all. 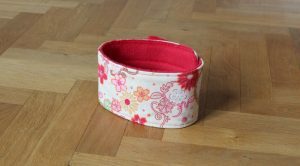 The nice thing about these is that they’re incredibly quick to make and put leftover fabrics to use quite nicely. 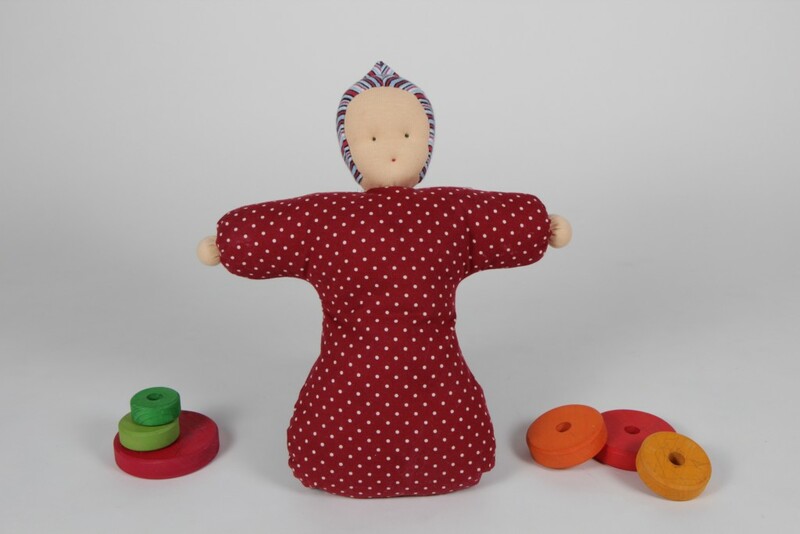 That said – consider yourself warned: There’s holiday dresses, baby bedding, a knitted bonnet and a bedside table substitute to blog. Here’s hoping I’ll get all those posts up soon! …I am here for another post! 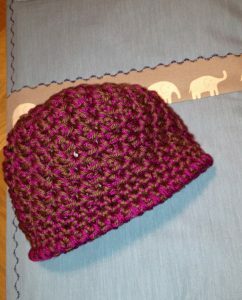 If the bag was considered the birthday part of the present, the little crochet hat has to function as a christening present. I used this butterfly hat pattern and I hope it’ll fit. Isn’t that butterfly (bow?) detail just adorable? 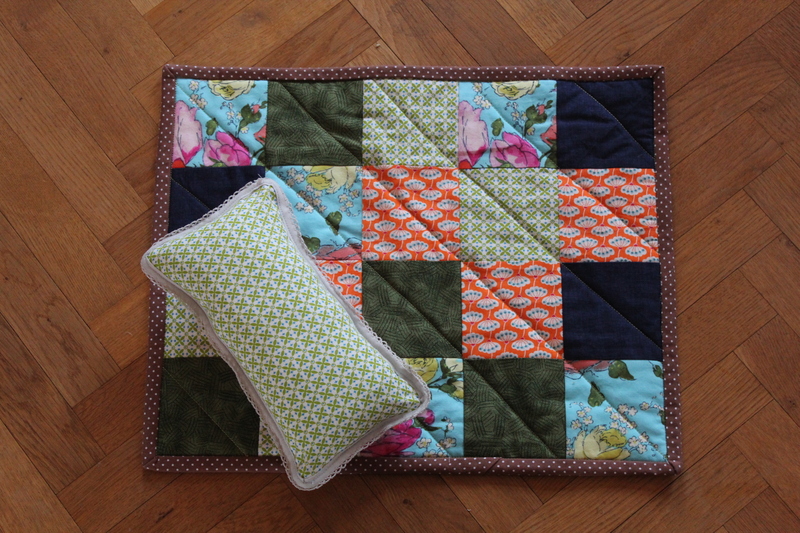 And very simple to make, too! 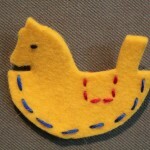 All in all, making these took but one day – and I even had some time left to whip up a little stuffed fish from leftover fabrics for each of my children – they really do have enough stuffed animals without these, but making them was quite a lot of fun! 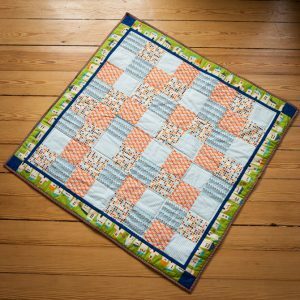 I recently discovered a must-have accessory for any Lego-loving kid: the Lego Storage Bag/Playmat – and made one as a gift to two little boys. If you know any children playing with Legos you have probably had the pleasure of stepping on a piece once or twice. Also, you might have dutifully (and silently cursing?) picked up what seems like a thousand pieces scattered on the floor. This storage bag /playmat solves at least the picking-up problem – provided you can convince your Lego player/builder/architect to actually keep the pieces on the mat. 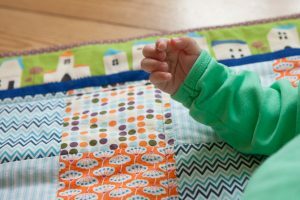 This playmat is easy to make – but if you don’t have time, an old sheet works just as nicely for quickly picking up Legos, just not for taking them with you. 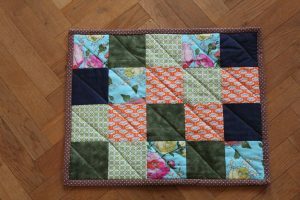 The easiest way to make the mat would be to cut two rather large circles of fabric for the front and back, sew them together wrong side up and leaving a hole for turning. 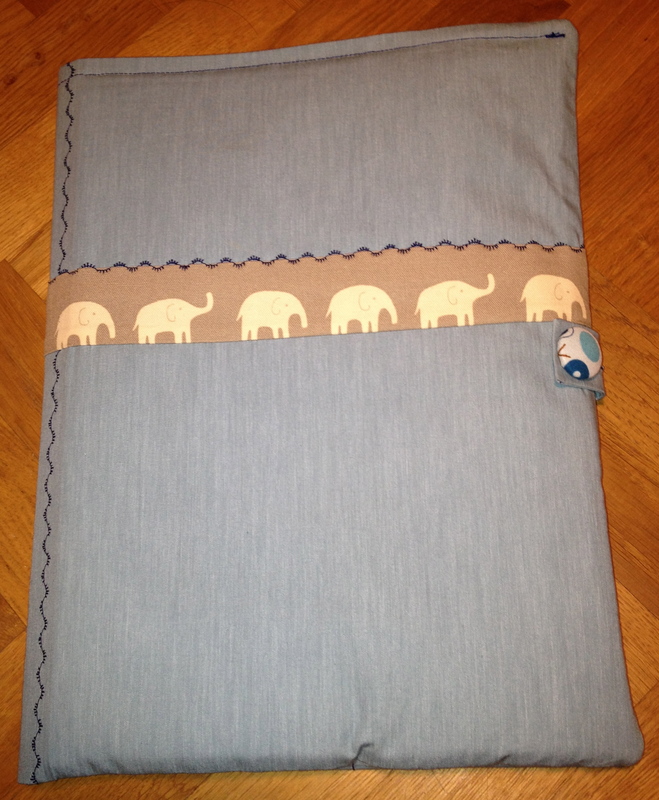 Once turned, you can add grommets for the drawstring and the drawstring itself. 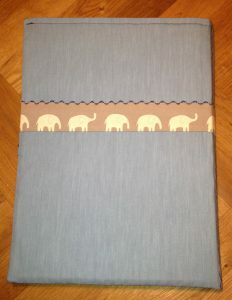 I just might have to make one for my own children – I think it’s much nicer than just an old sheet – what do you think? 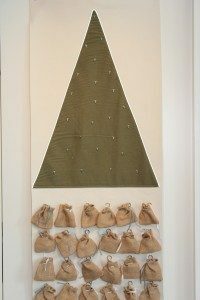 … I’ll post our advent calendar as I promised to! The solution to the puzzle came when I stumbled about this lovely advent sew-along over at homemade by jill. Isn’t it great? 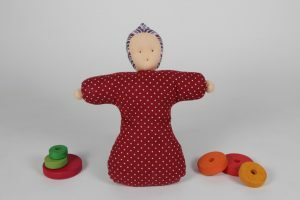 It uses little felt ornaments that the children can hang to a fabric tree each day and you can just store it away after the holidays and hang it back up the next year. Deciding to make one was a no-brainer, actually getting started (and finished) before December 1st quite a challenge. The reflector piping makes for a nice snow-like flash effect, don’t you think? Other than in flash photography it only shows from certain angles, though. Thanks to Michael for taking all the pictures and animating them! The children shared the calendar – taking turns in opening each sachet and hanging the ornament. They didn’t seem to mind at all that there were no „real“ presents involved and even suggested using the calendar again next this year. Now go and make one – you have 139 days starting today! I owe you more than one post, but first and foremost: Happy New Year to all readers and thanks for checking in! 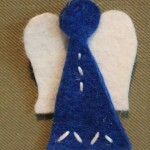 I made the angels from wool felt I had left over from the advent calendar my husband and I made for the kids this year. 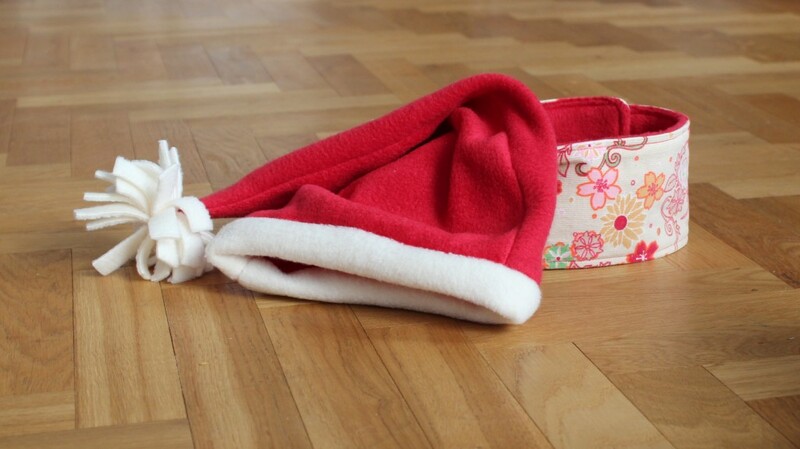 Unlike felt you get in most craft supply stores this is made from real wool and quite sturdy. It came in beautiful colours, there also was yellow, green, dark brown, purple… just wait for the advent-calendar-post (at the rate I’m going now, I think it’ll be up in July). 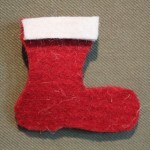 Anyway, the hard thing was to actually cut the felt – I used nail scissors. 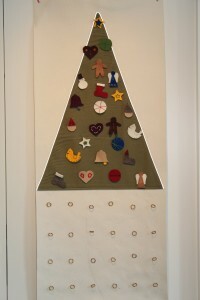 Everything else is rather self-explanatory, each angel is made from two parts joined together by a couple stitches. 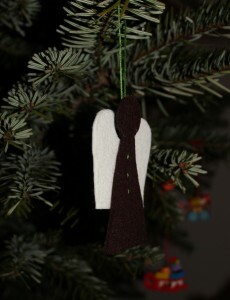 I used contrasting thread and kept a sling for hanging the angel. I love how they turned out (and that they were quick to make). They make for a lovely addition to any present and they fit in a small envelope – so you could add them to your christmas cards as well! Now it might just be time to put it away and store it safely until December. Here’s hoping I’ll get around to posting a little earlier than that. An answer to the puzzle! 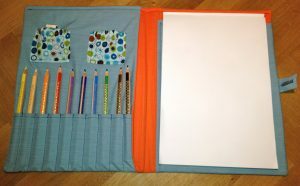 I figured new brothers need presents, too, and new parents something to occupy them with – enter the „to-go-artist“. 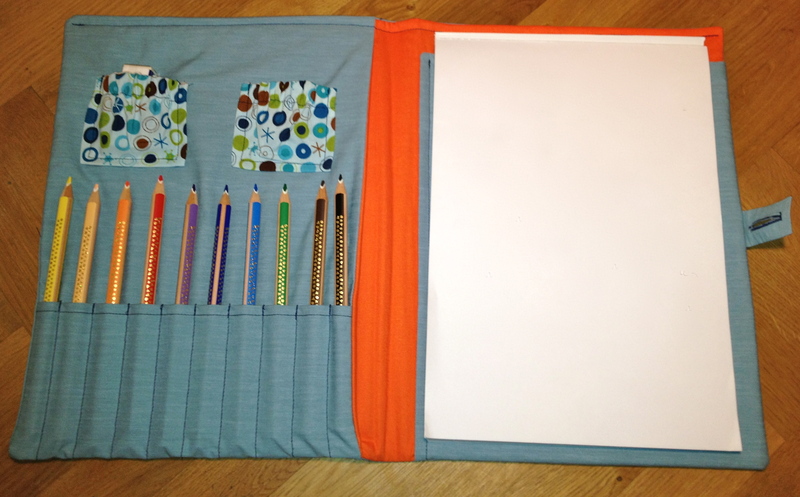 It houses crayons, paper and has room to slip in a book, scissors, sharpeners or whatever the artist needs! Instead of velcro for the closing, I used a button – oldfashioned, but working nonetheless and not as likely to get caught in something. Wouldn’t you want one? I would!